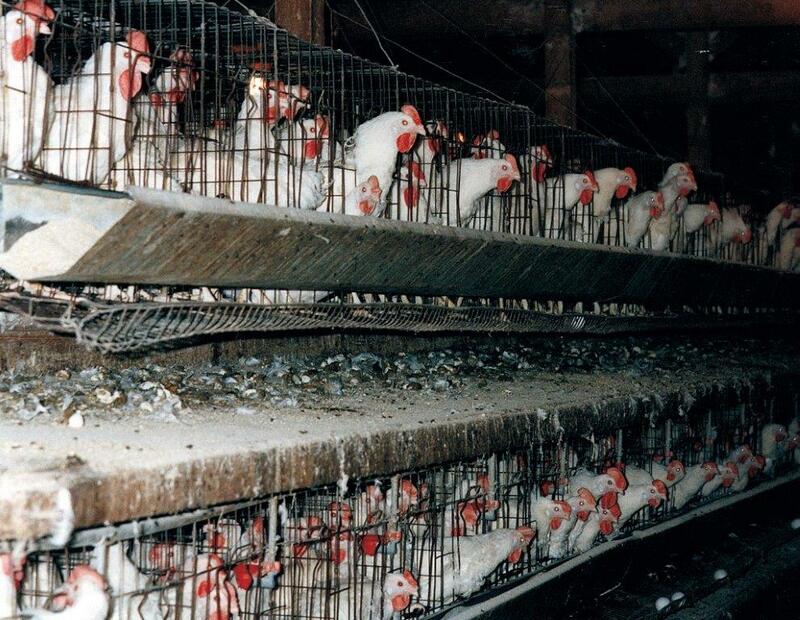 These poor egg-laying hens are crammed into such tight cages that they can’t move and become so aggressive with each other that their beaks have to be chopped off. Debeaking is the industry standard. It is the same as having a body part amputated without anesthetic. 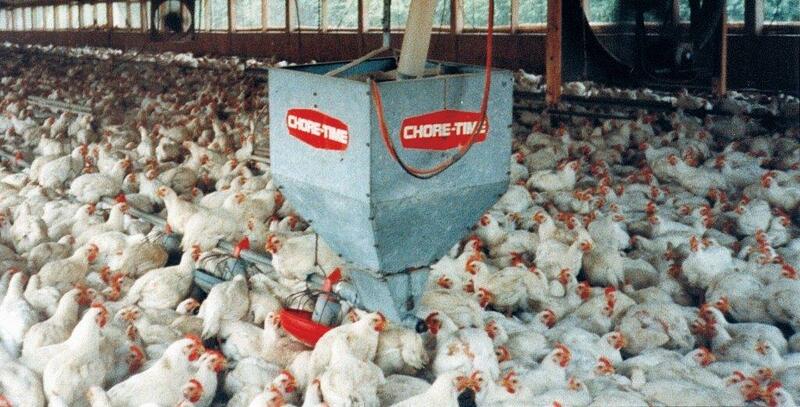 Debeaking is also done to broiler chickens. The laying and broiler birds can be so riddled with pain from this common procedure that they can’t eat for weeks and die. Some hogs live in such tight quarters that they become aggressive and bite each other’s tails. Instead of giving them more space, the factory “farmers” just cut the hog’s tails off, much like debeaking. Many pigs live in gestational crates their whole lives where they cannot turn around. Watch this video to get an idea of the hellish life of a pig. Dairy cows suffer the same fate; they stand in stalls so small that they cannot turn around for their whole lives and they are forced to produce 100 lbs. of milk a day. That is 10 times the amount of milk that cows naturally produced a few decades ago, thanks to recombinant bovine growth hormone (rBGH). rBGH has been linked to cancer in humans. The poor cattle raised for beef are raised on confined feed lots where they cannot move freely. Instead of eating grass, they are fed cheap grains, such as genetically modified corn that makes them grow fat quickly. Instead of grazing the land as these animals once did, they all stand crammed together on concrete or slatted floors (except the cattle who just stand in noxious filth), which their bodies were not meant to do, because it makes manure removal easier. It causes them pain, skeletal defects and innumerable diseases. Yes, all of these animals are disease ridden. What is the factory “farmer’s” response to that? Of course it is to pump these animals with antibiotics which has caused a surge in antibiotic resistant diseases in the U.S. That means your body may be immune to antibiotics when you really need them because you get daily doses from your meat. Do you think your chicken is antibiotic free because it says so on the package? Don’t count on it. There is a nice loophole that says standards for poultry don’t begin until the second day of a hatchling’s life, so antibiotics for chicks are administered on the first day of life. Voila, antibiotic free chicken. I won’t go into detail about how bad this is for the environment, but the greenhouse gases from factory farming have set up a disaster for our planet. It can easily be reversed by letting animals graze as they were meant to. Mother Nature had a plan. We are not smarter than Mother Nature. Eating animals that are raised in factory farms is unhealthy for you, unhealthy for the animal and unbelievably inhumane. Think about the rise in human diseases over the past 20 years. This time frame correlates to the rise in factory farming. What can you do? Certainly cutting back on your meat consumption is first and foremost. There is great evidence that suggests that eating a vegetarian or vegan, plant-based diet is the BEST thing you can do to deter heart disease, diabetes, Alzheimer’s and cancer. If you do want to eat meat, make sure your beef is 100% grass-fed beef. Check to see if it is, “Finished on grass” or you’ll be getting duped again. For chicken and eggs, make sure it says, “Pasture roaming” not free-range or cage-free. These are more nutritious options for you that are far less cruel to the animals. Try to buy meat, eggs, poultry and pork from local farmer’s markets. Question them about their practices including how much time the animals roam freely, what they eat (make sure they are not supplemented with GMO corn) and you can even inquire about how they are processed (killed) if you want. Author LaurenPosted on July 21, 2014 March 11, 2017 Categories UncategorizedTags "All natural", animal cruelty, animals, beef recipes, cancer, chicken recipes, chronic disease, diabetes, factory farming, factory farms, Farmer's market, food safety, gastro intestinal problems, Health, healthy lifestyle, Monsanto, plant-based diet, rBGH, Vegan, vegetarian, Wellness, what should i feed my kids? Ugggg… Thanks for that update. I always order chickens from my doctor and a farmer locally. Also get my eggs from another farm. That is the way to go. I stopped eating meat a year ago and once in a while eat chicken that comes from a ‘real’ local farm, although less and less. I do eat fish, which that industry has its own problems too. I closed my eyes to the inhumane practices for too long and I have regrets but feeling better about my choices now. I just don’t think people realize (or want to) how bad it truly is for these animals. Great post. Thank you, Joyce! Good for you. I always think that these practices don’t go on in Italy. I don’t know why. I guess it’s because I saw so many gardens while I was there and everyone ate seasonally. I’d love to know how they raise their livestock. Well….not sure what to think either….I mean…people have chickens in their yards…everywhere…even in the cities (if you have a yard)….I am guessing those are for eggs….and for veggies and fruits….yes…always seasonal and sometimes grown in one’s own garden…but for livestock? I imagine it must be like everywhere else…maybe this would be a good thing for me to investigate…I am curious now…. Uh, didn’t mean to repost. I was just updating something. I don’t think that is TMI. That is the best way to get meat! Is raw milk legal where you live? I’m so glad you reposted because I knew I had read that post but couldn’t remember where. I am about to have my blogaversary post which will be a recap of my first year without meat. Your post had a profound effect on me (since I did give up veal back then) and it was around then I gave up poultry too. I will add a link to you on my post when it goes on the 25th. I hope you like what I have to say.